Published on July 23, 2017,	by admin in Alaska Trip. One of the best parts of hiking the AT was the people you meet. This trip to see Alaska has been like that in some ways. 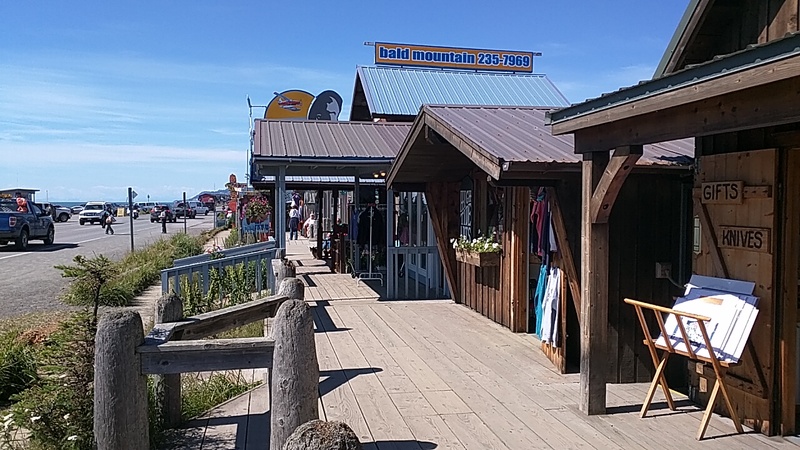 In campgrounds, tourist attractions, beautiful scenic places, and all along the highway, you run into people with the same pilgrimage – to explore this great and beautiful land of ours. 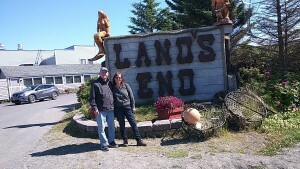 Me and Diana at Lands End. When I was in Seward I ran into a fellow traveler and we became instant friends. We had such a good time talking about our adventures on our journey, we decided to meet up in Homer and spend a few days together enjoying the Peninsula. 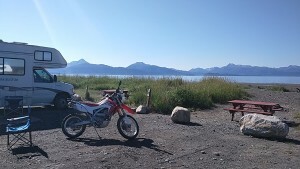 I arrived in Homer a day before Diana and the next morning reserved two spots out near the water on Homer Spit. After spending the night at Fred Meyers in Soldotna, Diana joined me here in the Mariner City Campground. In the afternoon we rode Honda down the Spit to walk around the many shops and tourist haunts scattered like an Atlantic City Boardwalk along the ocean. Diana bought a couple of souvenirs for her kids and I found a fleece jacket with a Homer logo that will always remind me of the good times here. 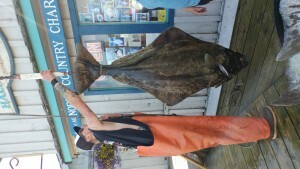 We stopped at a fishing trip place where they were weighing the Halibut caught by the guys on a recent trip. One of the fish weighed 148 pounds and was over 6′ long. Diana has the picture and I will post it when I can get it, so no one thinks it is just a “fish story”. There are glaciers across the bay. Later on we took a walk along the beach as the tide went out. The water was surprisingly warm. We thought it would be quite chilly this far north. Diana’s dog Carter loves to retrieve a stick thrown into the water and we watched him play fetch whenever we found something to throw. On the way back we ran into another couple we had met earlier and joined them at their camp for good conversation until after 11 pm. The sun finally set and the air grew chilly, so we all retired to our RVs for the night. 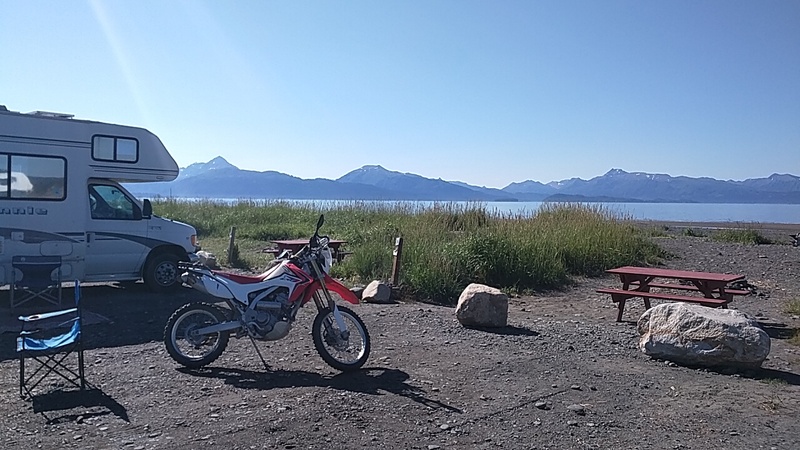 It was a good day with nice people on Homer Spit. How nice to travel so far from home and make a new friend. Diana must really have an adventurous spirit to have climbed on the back of Honda and ridden down the Spit with you. There aren’t many of us who are willing to do that! You are having the time of your life! How are you ever going to top this trip?